New communication technologies have made the life of language learners easier than ever: anyone with a computer and a decent internet connection can now connect, at the click of a mouse, with experienced, motivated and professionally qualified language teachers from just about anywhere around the world. Indeed, chances are you’re familiar with platforms such as Skype or instant messaging apps such as WhatsApp, WeChat, and many others. But have you, as a language learner, ever thought about leveraging these tools to your advantage, and save a lot of time and money doing so? I’ve been learning Mandarin Chinese for some time now, but one of the areas that I know I’ve always needed as much practice as possible (as I’m sure most of us language learners usually do) is when it comes to speaking skills. So when I found out about eChineseLearning, one of the world’s premier online Chinese language schools, I couldn’t resist their offer for a free live 1-to-1 30mn lesson with a professional Chinese teacher. I signed up right away (they only require your name, email, and phone number), received a call the same day from a well spoken customer service representative, and had my 1-to-1 lesson booked for the next day. SHOULD YOU BE SCARED TO TAKE ONLINE LANGUAGE LESSONS? So how did it go? 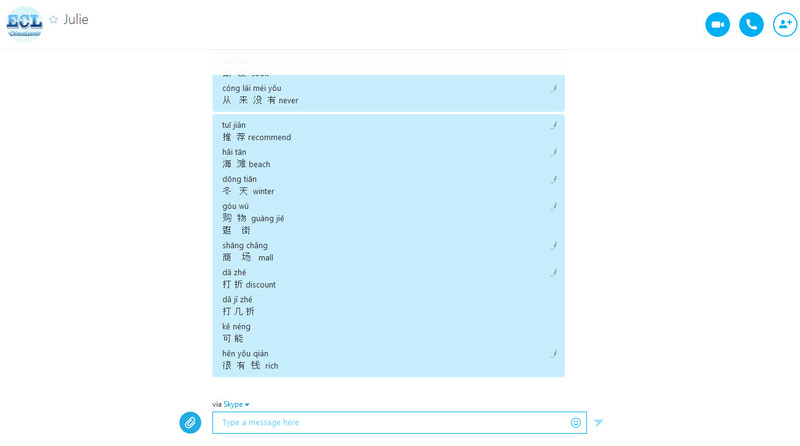 Well, I’m not going to lie: I’ve always had a bit of apprehension before hopping on Skype, or some other kind of instant messaging app, and connecting with a complete stranger in a language I’m not too familiar with — in my case, Mandarin Chinese. In fact, I’m sure a fear of the unknown and related apprehension about taking language lessons online for the first time is one of the reasons why so many people hesitate to take the leap and give it a try in the first place (if they knew how much cheaper and convenient it was compared to group language classes at schools and universities, however, they’d probably sign up right away!). But suffice to say, as soon as I connected with my teacher Julie, I was pleasantly surprised at how professional she was: right from the beginning she made me feel at ease, gauged my level in Mandarin, and began conversing with me in the language while also providing helpful explanations in flawless English. What made the experience particularly rewarding for me was that Julie wrote key words and phrases that we came across during our conversations on Skype in pinyin and Chinese characters, along with the English translation, something you simply can’t get with an in-person teacher or group classes. Every time I struggled to find a word or an expression in the language, she would write it for me and make me practice using the word of phrase straight away, which definitely helped with remembering things and putting them to use in context with a native speaker. This is also especially handy after the class ends, because you can then simply copy everything and paste it into a document or app for later review. HOW MUCH DOES ECHINESELEARNING LESSONS COST? 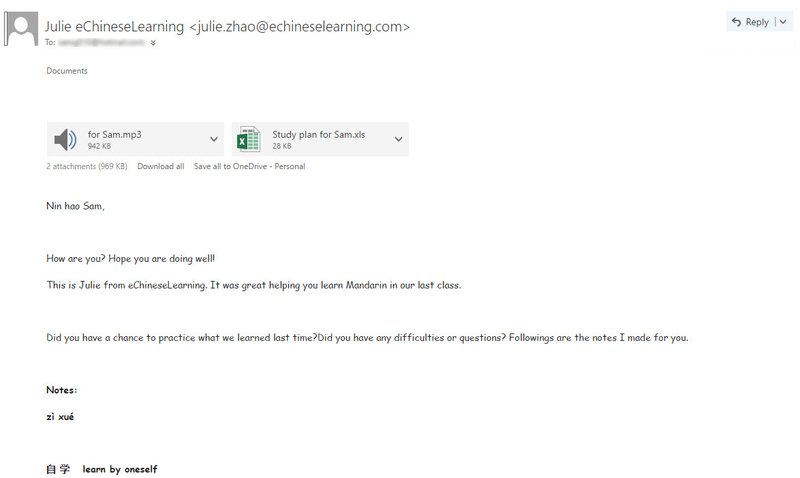 At the end of the lesson, Julie connected me with one of her colleagues from eChineseLearning, who then made sure I was 100% satisfied with the lesson I had just taken. I was asked a few questions about my Mandarin learning plans, and I was given a link with a personalized, special offer for bi-weekly classes with eChineseLearning. Depending on your needs, availability, level, and plans, rates will probably vary, but in my case I was given a price of about US$180 per month to take up to 3 classes per week (12 classes per month) from highly qualified Chinese teachers directly from China, with a 30-day money-back guarantee. I don’t know about you, but this kind of price for professional language instruction (and individualized based on your own level, pace and learning style) is about as good as it gets. I was also given the option of using the Mandarin Chinese textbook I have for lessons, or using the teacher’s recommended one. Once you sign up, you will be assigned a primary teacher, with whom you will have the majority of your lessons. That teacher will also be responsible for designing a lesson plan for you and for adjusting the pace of teaching/learning based on your own abilities and needs. Overall, I have been very impressed with eChineseLearning and I will be continuing to take lessons with their teachers for the foreseeable future. What I have found especially surprising was the quality and dedication of their teachers. In fact, a few days after having completed my lesson with Julie, she sent me a personal email with a complete lesson plan she prepared along with a recording of useful words and phrases we went over during our Skype lesson to help me practice my listening. She definitely went above and beyond all expectations, and it’s nice to see this level of professionalism and dedication from your teacher. If you haven’t done so yet, sign up for a free live 1-to-1 30mn lesson with one of their professional Chinese teachers, and start practicing now. Think about it: what have you got to lose? Oh, and one more thing: tell them Lingholic has brought you to them, and when you sign up for a package for at least 3 months, you’ll get one full week’s worth oflessons for free.